Vibration is often the cause of failure in many processes. Detecting it early is of vital importance to your preventative maintenance strategy. Our team of highly trained professionals are able to ensure that your vibration testers are performing correctly and conform to all manufacturer standards. Our Standard Calibrations are fully traceable meeting all national requirements. Our Laboratory is ISO9001:2008 accredited and carries out calibrations across many scopes. We are experienced in calibrating many makes and models of Vibration Tester so you can be assured that your equipment is in safe hands. Vibration meters are used in various industries such as maintenance, automotive, manufacturing & production, laboratories, regulation & control and product quality testing. 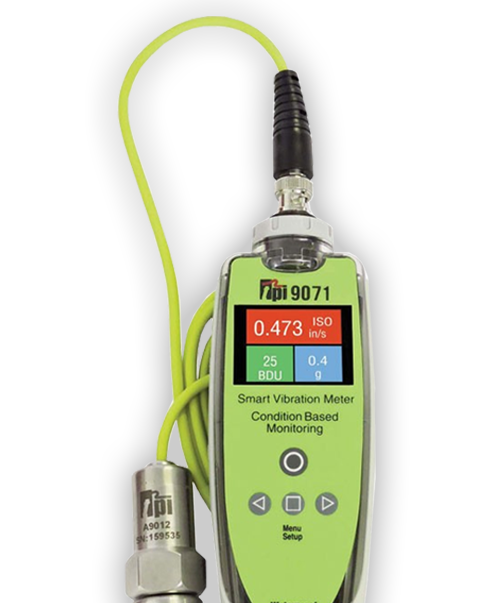 A meter that displays inaccurate readings due to it not being calibrated or being faulty, could mean faulty product production, inadvertently not adhering to certain legal requirements and compromise to structures, machinery and tools. Therefore regular calibration is vital to ensure accurate and reliable readings.